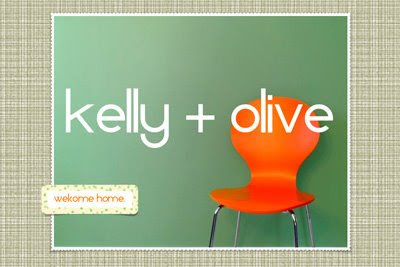 The new Chicago-based interior decorating business Kelly + Olive is offering a giveaway to How About Orange readers! (You don't have to live in Chicago to take advantage.) If you've been helplessly wondering what to do with that blah room in your house or apartment, the "young, professional, modern, whimsical, pragmatic, ecclectic, and thrifty" pair from Kelly + Olive will help you solve your decorating dilemma. "For virtual clients, we're offering our Style Sheets, a six page presentation which includes a moodboard with inspiration photos, suggestions for furniture placement, window treatments, color and fabric selection, and accessories. We source everything we suggest, so it's easy for you to find online or at a local store. We work within your budget and your constraints. If you can't paint, no problem, we totally love that color anyway. If your husband's bowling trophies MUST be displayed, not only will we work them in, we'll make them work! If you're in the Chicagoland area we'd love to work with you in person! The service is essentially the same, except we'd get a little more face time to plot and plan with you, which we love. We'll even take you shopping!" Leave a comment on this post mentioning one thing you dislike about your current home. (Might make for some entertaining reading!) Contest ends Tuesday at midnight (CST). Make sure to leave a link or way to contact you if you win. The winner will be randomly selected using a number generator. For a complete outline of Kelly + Olive's services and more about who they are, visit www.kellyandolive.com. You can view more style sheets on their blog right here. The bedroom in my apartment could use the most work... it's a decent size but it's also sporting old, dingy carpet and some crumbly walls. I'd love a way to cover all that up with a fresh, clean look. The room is also full of mis-matched furniture and knick knacks. I could use a general pare-down so I can add in a desk/workspace too. Everything is way too safe (read: boring!). I like my house, the cute-ness, the charm, but don't like that it's not very "finished". ALSO I especially don't like my son's playroom because it's not set up well for him, and doesn't maximize the space for maximum fun. My living room is small and narrow, and my heater takes a huge chunk out of one wall. I can't figure out how to group my furniture so that you can watch TV from all the seating - everything's just pushed against the wall on one side of the room or the other. Help! i haven't found curtains i like for the front room in 5 years. i'm still looking at a black hole. My least favorite thing is the horrid, light colored woodwork! Icky! i don't like the layout of our house. it's very difficult and has an awkward flow. I am in a wheelchair and my hubby is a vertical guy. Our bedroom feels crowded with our attempts to make the room clear for me to get around and stuff at mid wall height. I dislike my living room. I was going for a mix of Renaissance and gypsy traveler and it doesn't look like that at all! There is too much burgundy-my couch, my chair, and my curtains are all the same color. Then there are random bits of gold and purple that don't make sense. My collectible swords are just laying on the floor when they should be on a wall. Can you make my dream of a rich, warm Renaissance/gypsy traveler living room come true? I have a dining room that serves no other purpose than as a place to store boxes (I moved in 4 months ago). Help! In my living room I have a full windows across one wall, a full wall of built-in shelves and cabinets on the opposite wall, and a fire place on the third wall. Focal point? Who knows where it is. Please pick me! I need to integrate the book collections of two people with English degrees and varied tastes. Our house is full of books in every room. And all of them are too precious for us to give up, you know! I'm getting married this May and moving into my fiance's 3 bedroom home. Right now it looks very bachelor-like and could use some sprucing-up. I'd start with the living room, that way guests feel comfortable as soon as they walk in. I have random stuff in my house that has been with me since college. I need the style and overall feel to grow up a little. I am in a 40's ranch now, and really what we'd like to do is to connect the main floor with the finished rooms upstairs (accessed currently through the garage). However, that's more long range. :) short range I need advice on what to do with my former family and sun rooms.. we've just re-arranged things into the living room, and will have emptied the old family room.. It's pretty big but not artistic.. and its hard to find coordinating designs. I often find a dinner table I like, but afraid that I couldnt find other pieces that would go together with it. and same with other furnitures.. The house is still empty now. Our guest bedroom has not just one layer of wallpaper, but two! And it has to be at least 20 years old! My problem is fear of commitment. I see things I like, but I just can't commit to them! So I have several rooms that are just embarrassingly bare. I need help. Thanks. I have an open loft upstairs that is an office, playroom, foosball holding, library room and I don't know what to do. Aaaahhhh I need help! hhmmm, where do I start? we moved from a 875 sq. ft. NYC apartment to a house in Dallas. After two years, it's still mostly empty and being renovated (two bathrooms to go). I have one painting on the wall (from Etsy... love it!). While there are lots of things I love about my house, it does have an empty warehouse feel. I've really struggled with furniture placement and have been mostly afraid to purchase those big-ticket items for fear of picking the wrong thing and being stuck with it. Any ideas would be great! thanks for the chance! I've lived in apartments my entire married life so I've rarely been able to decorate how I want. Not to mention all my hand-me-down furniture; I like to call it eclectic. The thing I hate the most about my house is the carwash next door and our neighbor who refuses to haul out her old washer sitting next to her front door. We've offered to haul it to the dump for her many times, but she keeps putting us off. I swear my house it nice though. I swear! Window treatments. I have no idea what to do about our windows! Our neighbors would really appreciate it if we had some privacy:). My design ideas for my drab living room are all over the place! I want girlie, but bold and bright. I want modern and urban, but with some traditional concepts mixed in. PLEASE HELP ME! Hey Jess! Thanks for hosting such a fun giveaway! I just moved into my new place and the bedroom just doesn't -work-. Granted, I've only spent two nights there and I haven't unpacked everything but I can already tell it will need some serious help. It's an odd shape and due to floor vents and closet doors, the layout is extremely limited. The good news is I can paint! I really like my house, but I've been working on it for *so* long (well, it feels like so long, it's only been about two years) and am losing perspective. Those last pulling together touches are driving me crazy! So, I guess what I don't like is I feel like I've made the easy decisions and now the ones that are left are complicated :-). i feel like we have lived in our home for 4 years and yet it still doesnt have "our touch" we thought we were only going to be here 3 years and we're heading to 5 and the house needs some love. I'd love to win this! We just got a new house, so it's a blank board to work from. I like the paint colors we picked, but now we need to fill it up and make the house a home. Oh, and the bathroom is TERRIBLE. Absolutely horrible. Salmon pink tile, dark brown PLASTIC medicine cabinets and a shower head that hits me in the back of the neck. Gosh. Which room would I choose? My living room is over run with large pieces of wood furniture that my husband thinks are normal. Our bedroom door is blocked by his chest of drawers and gets "sliden" back and forth so you can go in and out. Still I might choose the office which always seems dark. Where to start? I am currently having trouble with my kitchen/living room/dining room. I hate my countertops and tile in the kitchen but there is nothing I can do about that right now. How do I get the rest of it to look good while living with that? They are not interior designers, they are decorators. Big difference. Interior designers work to uphold the safety and well-being of their clients and uphold numerous codes to ensure not only aesthetically pleasing design but safe design. The girls actually do call themselves decorators. Your post does not. Oh my Gosh - I NEED this! I'm a Chicagoan and we're in an apartment that we have done our best with, but we are looking to start a family and I want a fabulous nursery! When we bought our Condo I thought that having a TV niche, or Hole In the Wall for The TV, over the fireplace was a good thing - no dueling focal points (or as my Husband calls them "the place where you point all of your furniture"). I was wrong. I want to install a mantle but The Hole won't let me. I want to surround the The Hole with built ins but the gas fireplace controls, switch, and 10 thousand electrical outlets in the room won't let me. If I ever have another home, the only Holes in The Wall will be windows and doors. the thing i HATE about my apartment... it's my own fault really. i was doing laundry one night (i'm terribly lazy about doing laundry and that makes it a way bigger chore than it should be) and had carried in the basket full of clean clothes, the laundry detergent, and bottle of bleach upstairs from the apartment complex laundry room. i decided, "that's enough for tonight!" and set them all down and went to bed. I didn't notice that i had knocked the bottle of bleach over on its side. or maybe i did notice and decided it wasn't a big deal. well, that bottle of bleach leaked out a little and it ATE two holes in my carpet! it's totally stupid and totally my fault, but since we are in a crappy rental and moving at the end of our lease, i'm not going to have the carpet replaced. and the holes are in an awkward high traffic area right near the front door so i am unsure how to put a rug there without it being oddly out of place. i'd love to see if kelly and olive could come up with a workable solution to my weird little design dilemma! We are planning a humongous reno and need fresh ideas but we need to reconfigure what we have, do some editing and I need new eyes that see my stuff in a new way. Anonymous, thanks for the clarification. To me, they were the same thing. Little did I know! I've edited the post. Ooh, Ooh, pick me, pick me! I could definitely use help with our bedroom! We are in the process of texturing the walls and we tore out the carpet. Basically it's a blank slate, just plain painters white walls and concrete floors. I would love some professional advice about color. What we have has been there forever and we need something fresh and new. Exterior - my house is painted two different colors. The front is stone, one side is gray, the other side is blue, and they meet in the screeching halt of a paint roller above my back porch. Interior - my office is a horrible mash of unorganized furniture and my bedroom is severely lacking in furniture. Thanks for the contest offering! Please! Help! What do a bed,a chair, a dresser, a sofa, and two nightstands all have in common?! They are all in a really boring cocktail party and I'm the host. I need fun! music! style! I need YOU! I need MAJOR help with a playroom. I have nine-month old triplets so the playroom must stay. I just want it to look a little trendy and cool for kids. Right now it is white walls with toys. we just moved into a mid century ranch and need some help with furniture placement, and figuring out window coverings, and what else we need to buy! My husband and I just moved into a soft loft condo. We love everything about the house except the partial wall (the kind that are open at the top). If we do use a drywall to extend it all the way upto the ceiling, we will be blocking the only source of natural light in the 2nd bedroom. Need some creative ideas like textured glass panels or something that gives privacy but doesnt block light. The designs are really cool! i love the colors. It looks so happy and joyful. Perfect for happy and joyful people.